Features 5 cords, making it easy to connect your cell phone and other devices. The USB cord easily plugs into your computer or wall adaptor while one of the other cables plugs into your device for easy charging. 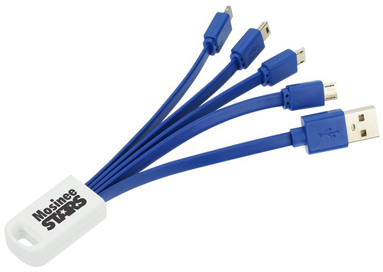 Include two micro USB connectors, one mini USB connector, one iPhone® Lightning compatible connector and one USB connector to plug into your computer or power source. Features a white plastic handle, keeping all of the cords together neatly. Ideal for travel or keep in your backpack so you are ready when you need a charge!